I have taught Holocaust literature—Night, The Diary of Anne Frank, The Children of Willesden Lane—for many years. But I cannot teach these books in the way I usually teach literary works of art. Granted, these books are not fiction, so I am spared having to chart the plot line. I know there are motifs and images and definitely themes—but my point has never been, in teaching any of these accounts, to reveal the writer’s technique. Putting such a text under the microscope of literary analysis would distance the students from the story, and I want them to hold close the visceral response they all have when they read, say, Night. Discussing Wiesel’s imagery as if he had sat down deliberately to craft a work of art instead of to tell his horrifying story to an unconscious world would be—to my mind—a sacrilege. As story, his journey through hell penetrates our unconsciousness and sears our souls. Ironically, what I could do would destroy its impact, and that I cannot do. But the Holocaust must be taught. Genocide must be admitted and discussed. Here is what I do instead. 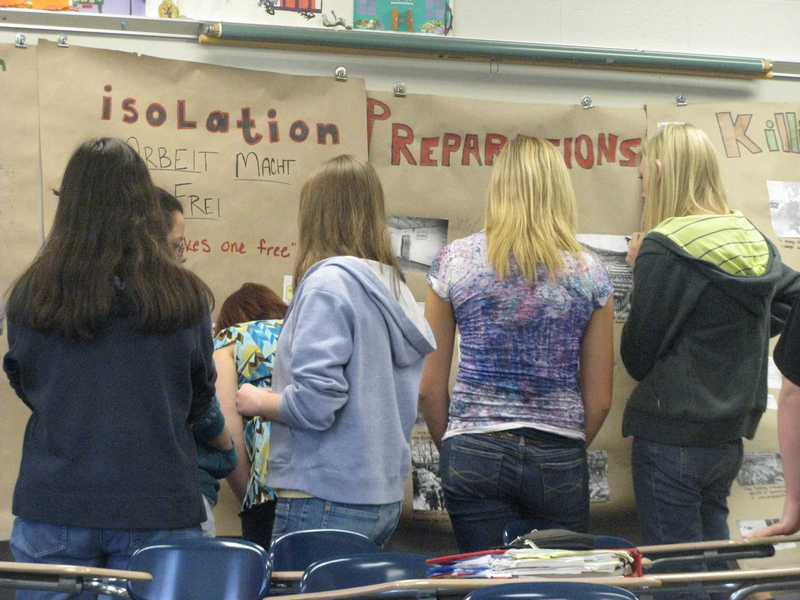 Most students, when they first learn about the Holocaust, do not immediately see the connection between the tragic events of WWII and their own lives in the 21st century. They think that genocide is a distant horror. But we, the adults, the teachers in the room, know about Darfur, where genocide is so fresh. We know about Cambodia, Bosnia, Rwanda, and other places that in recent history have served as the stage for mass murder. Genocide always begins with prejudice. A power group, for a variety of reasons, marginalizes, discriminates against, isolates, and ultimately demonizes a minority. The climax is the killing, followed by a strange denouement, denial. My students read Night first. They read it without a lot of preface, and they are full of questions during the three short days it takes them to finish the book. By the end, they want to know more, and it is then that I send them on a research mission. 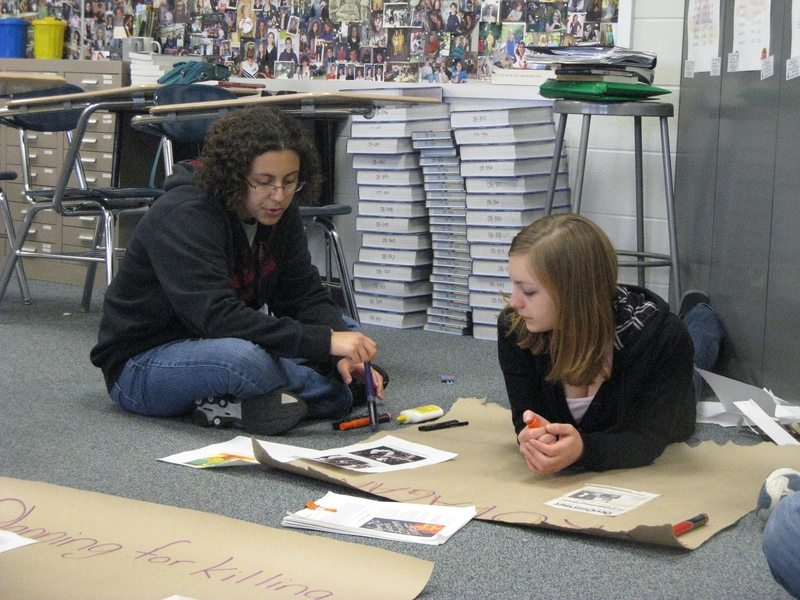 The students work collaboratively to construct poster essays that will reveal the pattern of genocide. They draw straws to form groups, and I give each group a title for the poster—the name of a stage in the pattern—and a few keywords to get them started. For the next several days, my room resembles an art studio—construction paper, scissors, rubber cement, watercolors, and magic markers dominate the landscape. Kids cluster around the tables, lie on the floor. They labor over their posters, placing pictures precisely and writing captions that capture the essence of the photographs they’ve downloaded. 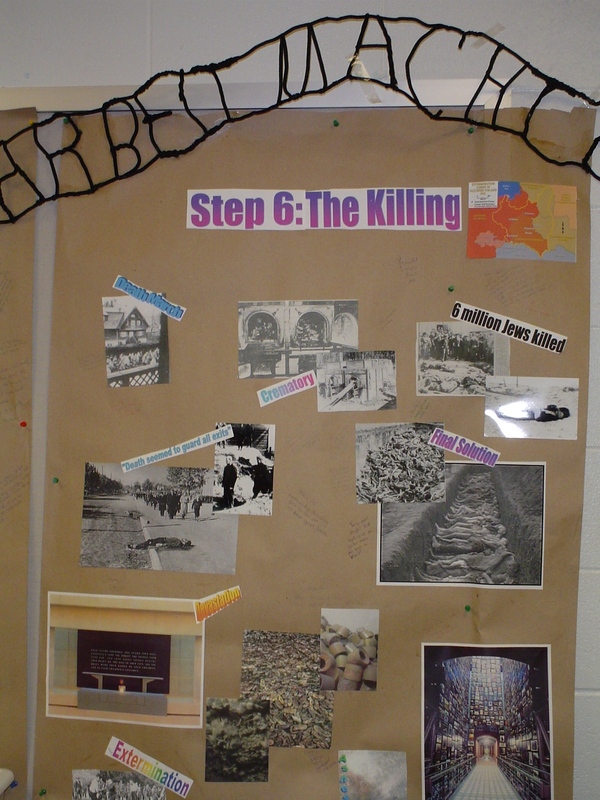 They know that what they are researching and presenting in their posters is too important to treat superficially, and their posters powerfully illustrate the progress from prejudice to mass murder. We put the posters on the board and discuss the order in which they should be hung: Prejudice, Legal Discrimination, Separation and Isolation, Preparation for Killing, and Extermination—and the one that could be hung anywhere and everywhere along the continuum: Propaganda. 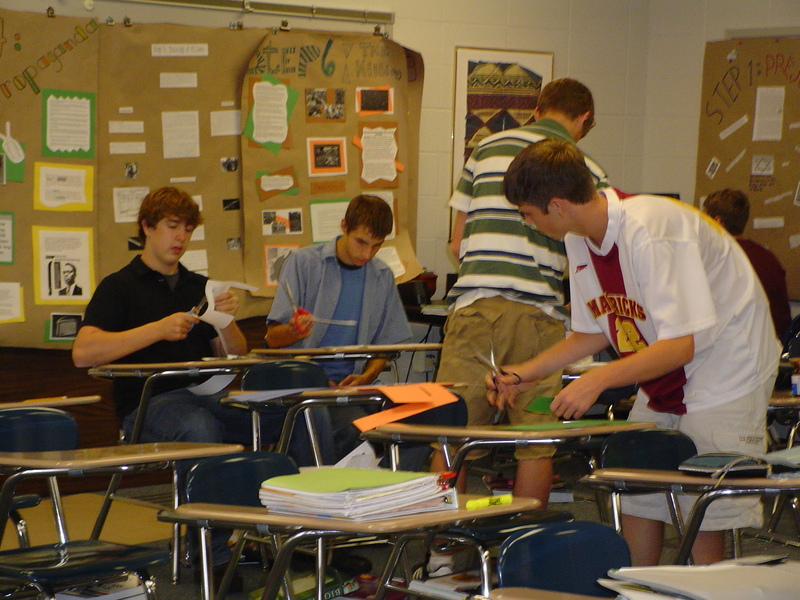 Then, after a brief introduction, I instruct them to repeat the research—this time researching Rwanda. They create, again, poster essays that depict the progress of the genocide there—from the identity cards issued by the Belgians when Rwanda was still a colony to the hate radio broadcasts that mobilized the Interahamwe. 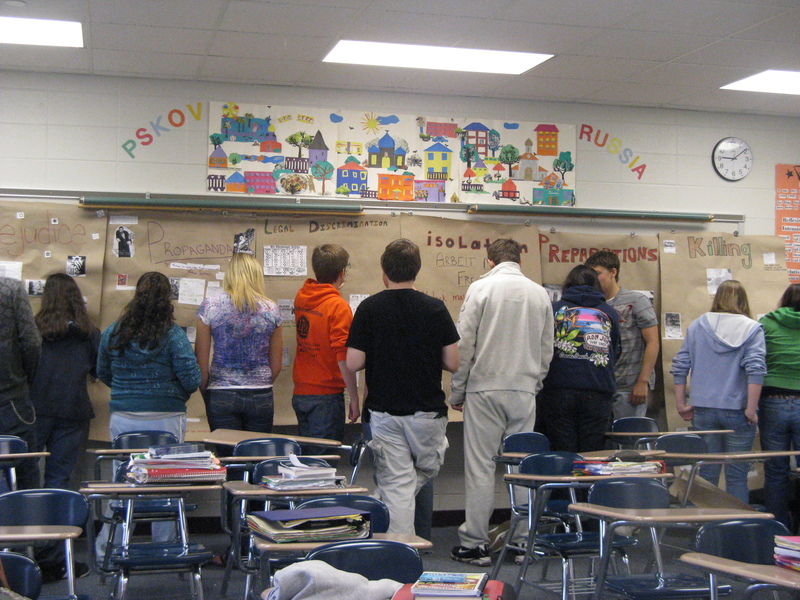 They hang the posters side-by-side on the whiteboards in my classroom: the Holocaust and the Rwandan genocide. I am not interested in discussions of scale—it’s not that kind of comparison. I am interested in the pattern. By studying the Holocaust and the Rwandan genocide side-by-side, my students come to see that neither was an aberration of history. By studying the pattern, they realize that genocide has its roots in attitudes that show up in day-to-day interactions, the kinds of discriminatory behaviors they themselves encounter not just in the evening news, but in the lunchroom, on the playground, in the halls, in gym class. Sometimes we call it bullying. 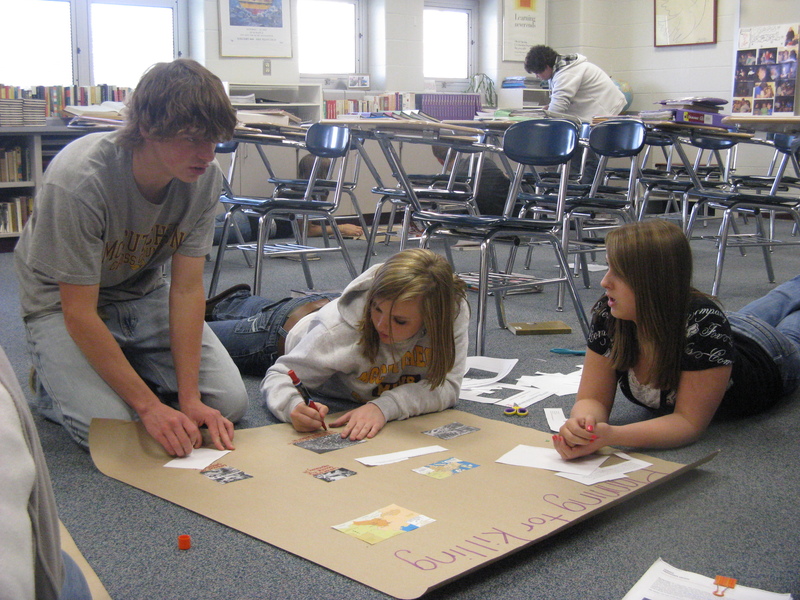 My students come face-to-face with the pernicious effects of prejudice in their study of these two genocides, and they understand the importance of speaking out against ethnic jokes in the lunchroom, bullying in the halls, discriminatory laws in their state and country, and unfolding events in places like Sudan. They understand the moral imperative to be inclusive rather than exclusive, to accept rather than reject. My students see that they can work to prevent genocide by voicing opposition to the prejudice they encounter and by engaging in activities that promote peace and understanding—both locally and globally. Sometimes it is as simple as writing letters to their Congressional representatives, to the Secretary-General of the United Nations, to the President. We live in a democracy where it is our right and our duty to let our voices be heard, to be “upstanders” for justice, not voiceless bystanders in the face of evil—and this responsibility becomes real for them. This past week, at the United States Holocaust Memorial Museum, Elie Wiesel and President Obama spoke about genocide prevention. In fact, on the very day my students and I were having a discussion about what they could do personally to combat the forces of prejudice and discrimination, these two men were discussing what the nation could do. I watched the video that night at home: My students had said many of the very same things these compelling leaders had said. I showed the video the very next day. Genocide survivors tell their stories—in books, films, and essays—not to create works of art that will make them famous, but with the hope that the lessons of their nightmares will not be forgotten, that people of conscience will work to stop incipient genocides before they occur and to speak out against ongoing tragedies. Teaching our children what they can do to combat evil in the world is work that teachers can do, must do. Absolutely riveting blog. I think it is extremely interesting the fact that bullying could be what starts genocides, because that is something that everyone can relate with. I agree with your statement about genocides having the same process to get to the eventual execution. It is very important to inform kids today about the horrors that could be brought about tomorrow. I’m not sure how old these kids are but they do need to learn to speak up about things that they do not think are right. Fabulous post. I’ll pass this on to my professor at ASU! Reading this post again today is chilling. If you are my former student–or even if you are not–what do you see? Do you remember? What can you do? Every voice matters.